There is no doubt that I have a sweet tooth. 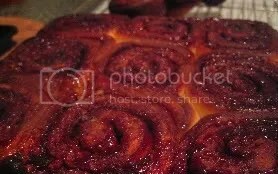 And what I have been craving are the caramelised, nutty, cinnamon-y bread like yummers for the longest time! 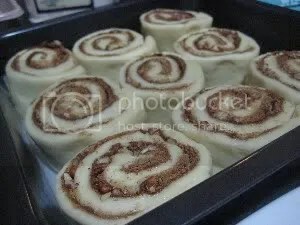 But instead of paying heaps for just one cinnabon, I decided to make some for myself! (: and boy am I happy I did. Cause the process of making it was so much fun! I wanna make more like tomorrow! haha. Bread or buns has been very foreign to me, and I always thought I need a bread maker to make awesome bread. Yeast is also something I am not use to working with, but I conquered that fear! 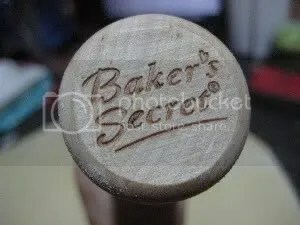 (: Absolutely love the sight of seeing my dough double in size and have crazy fun of punching the air out! haha. 1. Combine milk and butter in glass measuring cup. Microwave on high until butter melts and mixture is just warmed to 120°F to 130°F, about 30 to 45 seconds. 2. Pour into bowl of stand mixer fitted with paddle attachment. Add 1 cup flour, sugar, egg, yeast, and salt. 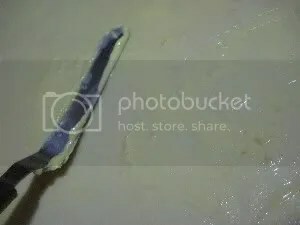 Beat on low speed 3 minutes, stopping occasionally to scrape down sides of bowl. Add additional 2 1/2 cups flour. Beat on low until flour is absorbed and dough is sticky, scraping down sides of bowl. 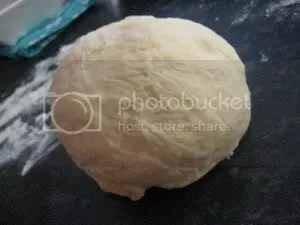 If dough is very sticky, add more flour by tablespoonfuls (I added a tablespoon more) until dough begins to form ball and pulls away from sides of bowl. 3. 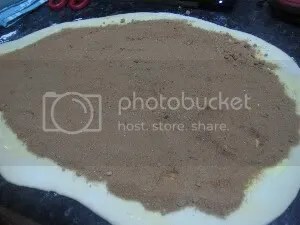 Turn dough out onto lightly floured work surface. 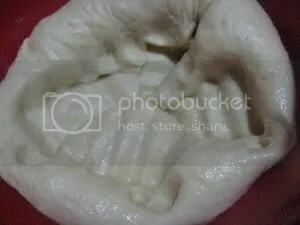 Knead until smooth and elastic, adding more flour if sticky, about 8 minutes. Form into ball. 4. Lightly oil large bowl with nonstick spray. 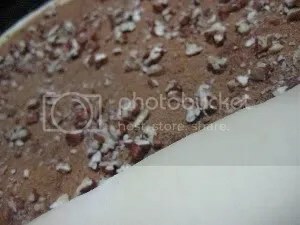 Transfer dough to bowl, turning to coat. Cover bowl with plastic wrap, then kitchen towel. Let dough rise in warm draft-free area until doubled in volume, about 2 hours. 5. 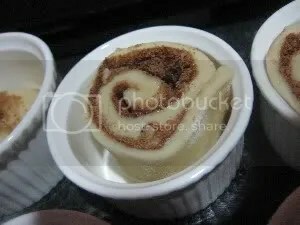 Mix brown sugar, cinnamon and pinch of salt in medium bowl. 7. 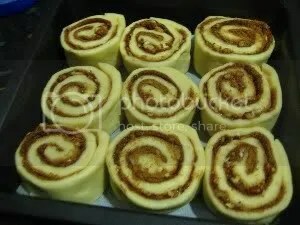 Starting at the longer side, roll dough into log, pinching gently to keep it rolled up. 8. With seam side down, trim ends straight if they are uneven (like Smitten Kitchen, I baked the leftovers in ramekins). 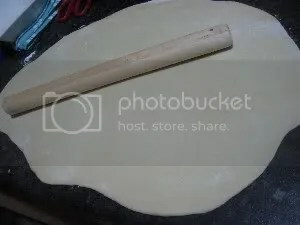 Cut remaining dough crosswise with thin sharp knife into 18 equal slices (each about 1/2 to 3/4 inch wide). 9. Spray two 9-inch square glass baking dishes with nonstick spray. Divide rolls between baking dishes, arranging cut side up (there will be almost no space between rolls). Cover baking dishes with plastic wrap, then kitchen towel. Let dough rise in warm draft-free area until almost doubled in volume, 40 to 45 minutes, though yours, like mine, may take longer. Don’t skimp on the double-rising time. 10. Position rack in center of oven and preheat to 375°F (190°C/ 170°C fan-forced). Bake rolls until tops are golden, about 20 minutes. Remove from oven and invert immediately onto rack. Cool 10 minutes. 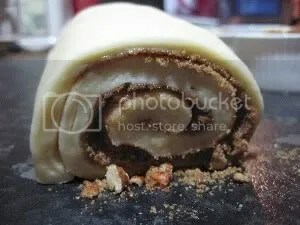 Turn rolls right side up. Damn, I knew I shouldn’t have visited your site while waiting for dinner to arrive but I couldn’t resist. Now I’m absolutely starving! These look soooooo good! aww thanks Laureen! (: Coming from you, it means alot! Cause you’re a pro compared to me! hehe. Hope your dinner will come soon! hehe and I’m looking forward to pictures of your hotcross buns! 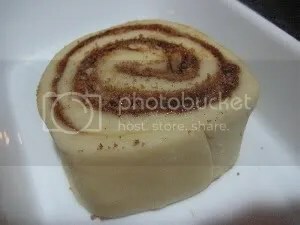 I absolutely love cinnamon rolls, and yours definitely look really tempting, particularly with the pecans! Thanks Lorraine! (: Yes, most definitely! I just baked Hot Cross Buns! Wow! 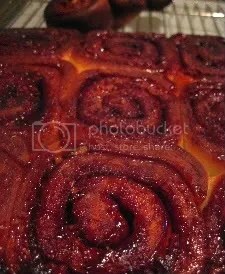 These buns will be a great addition to any meal as a dessert dish. I will definitely try it out one of these days. Thanks Aileen! (: You should try them, they were yummy! and a crowd pleaser!